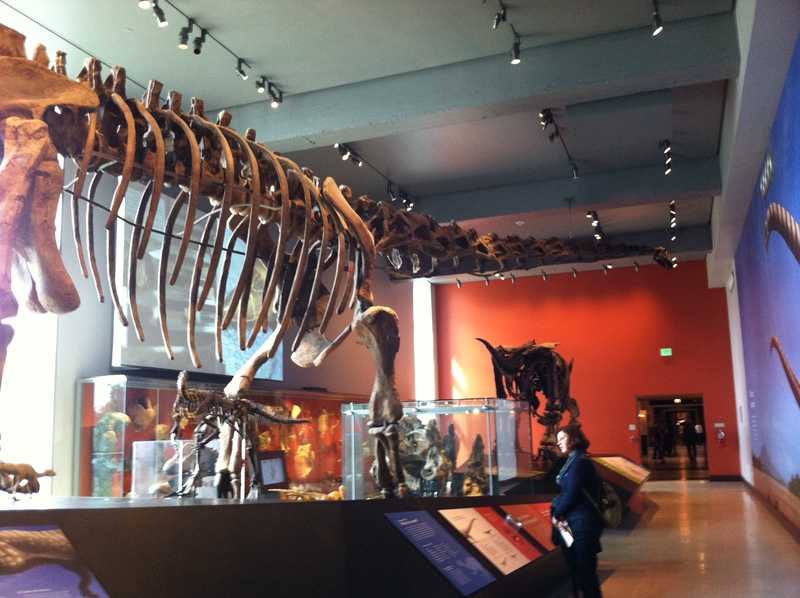 If you find yourself visiting southern California and you’d like a good crash course in the area’s history, let me recommend a visit to the Natural History Museum of Los Angeles County. Most of us associate natural history museums with fossils and taxidermy, but the NHMLAC also has an exhibit called “Becoming Los Angeles,” which covers L.A.’s story from the arrival of the Spanish up to the present. It opened last year. I’m not that familiar with the history of California, so this exhibit was an education for me. The section on the Spanish mission system is especially interesting; it explains the impact of European colonization on both the land and the people. The arrival of domestic cattle, for example, dramatically impacted southern California’s vegetation. Cows ate up the grasses that were native to the area while depositing foreign seeds in their dung. Hence the slogan emblazoned on souvenirs in the museum’s gift shop: Cow poop changed L.A.! Becoming Los Angeles features some pretty neat artifacts. 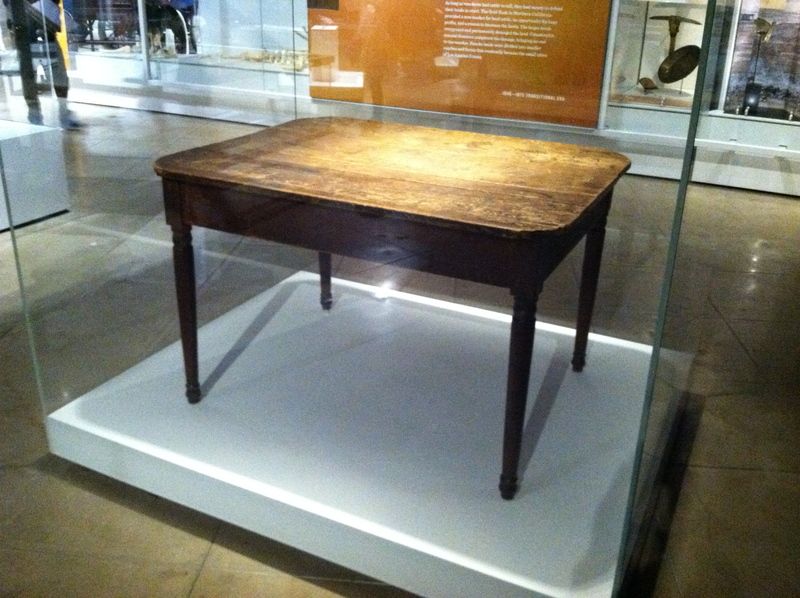 Here’s the table on which the Treaty of Cahuenga was signed in 1847, ending hostilities in the Mexican-American War in California. Of course, the war didn’t officially end until the Treaty of Guadalupe Hidalgo the following year. The exhibit also covers more recent history, including the city’s role in WWII and the birth of the local aviation and entertainment industries. Here’s another historically significant piece of furniture: Walt Disney’s animation stand, used to make the first Mickey Mouse cartoons. Other objects on display include Spanish crucifixes from the colonial era, Indian tools, and one of Charlie Chaplin’s costumes. 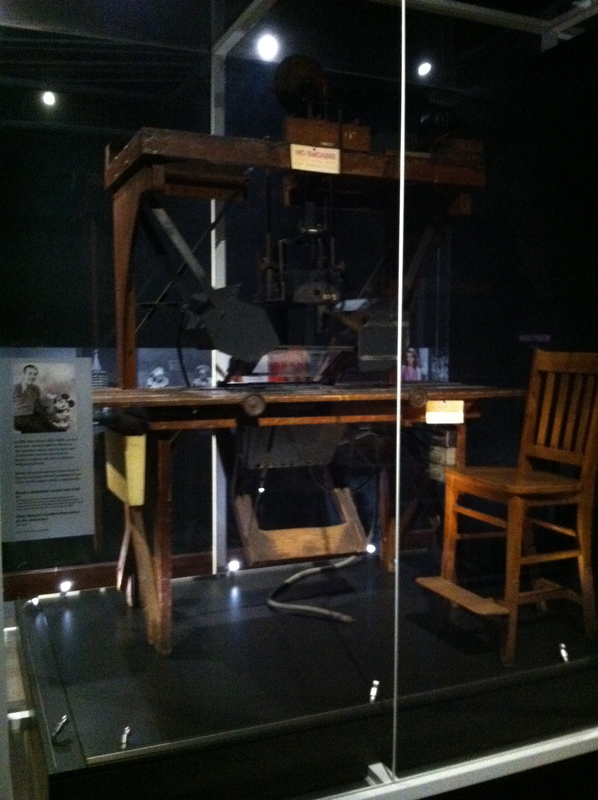 But hey…I didn’t go to L.A. to see history exhibits. I was off the clock. You guys know where this is headed, right? 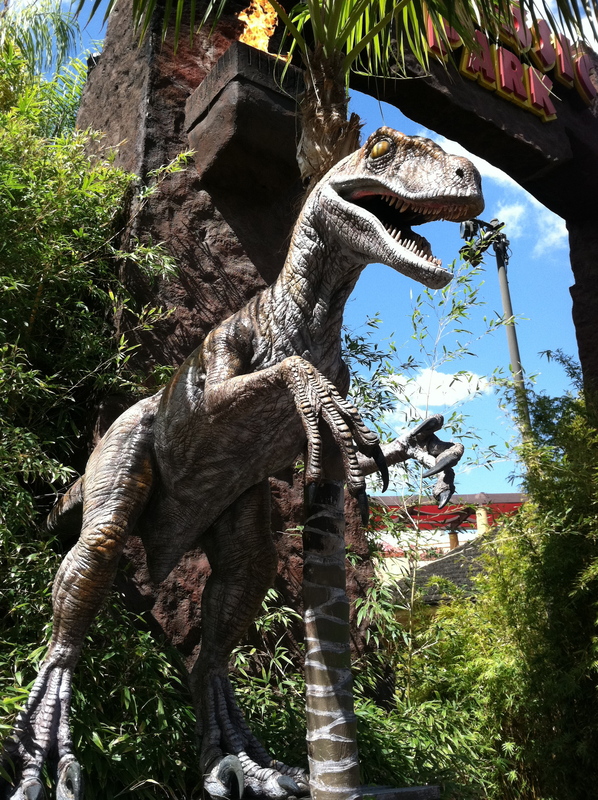 If you like tyrannosaurs, you’re in luck. 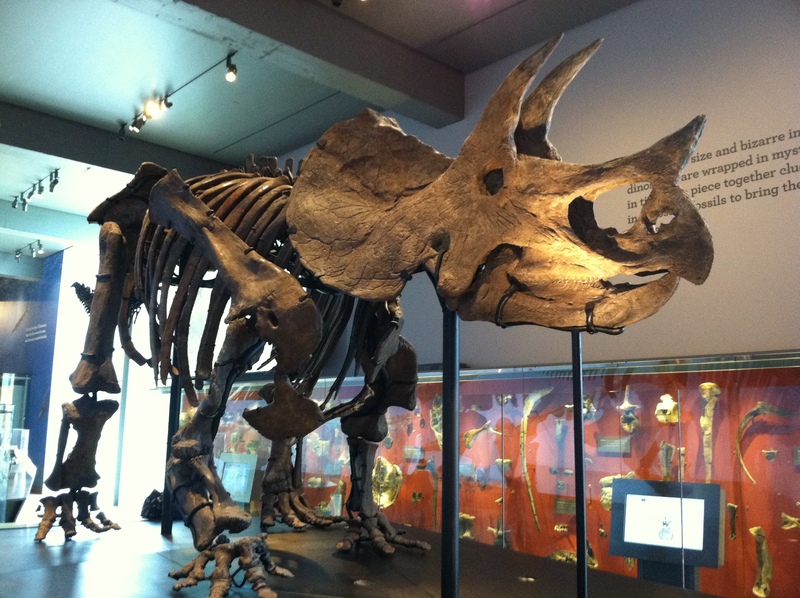 There are more T. rex mounts at the NHMLAC than you can shake a severed goat leg at. 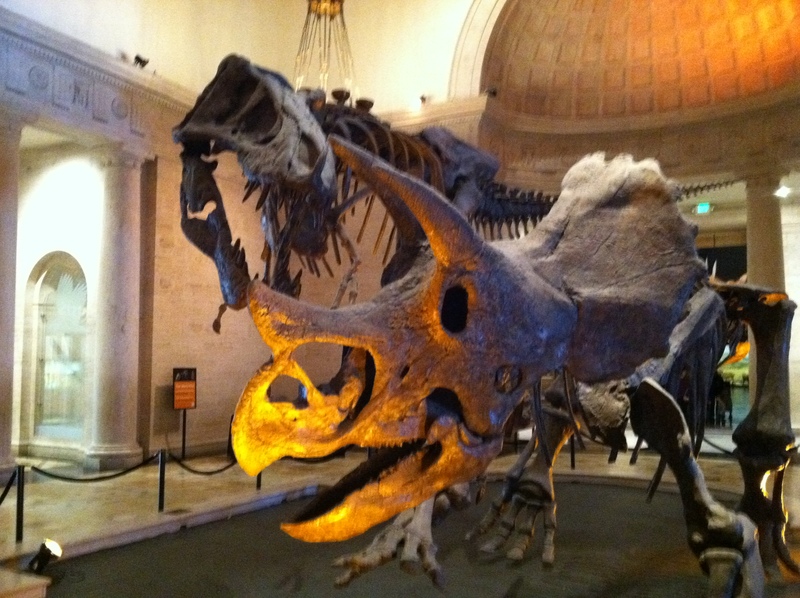 One of them is facing off against a Triceratops in the foyer. 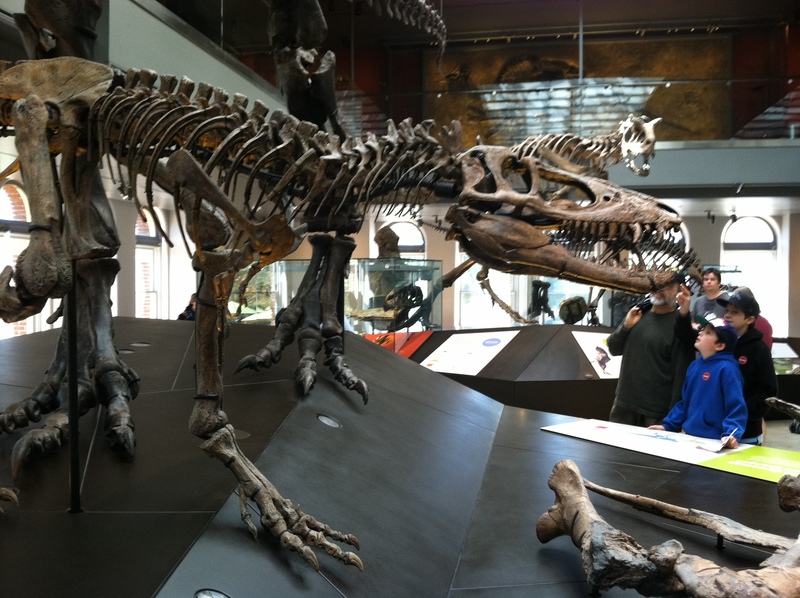 More tyrannosaur skeletons are in the main dinosaur exhibit. This is a really cool mount, because it’s the only place in the world where you can see three T. rexes of different ages posed together in a growth series. 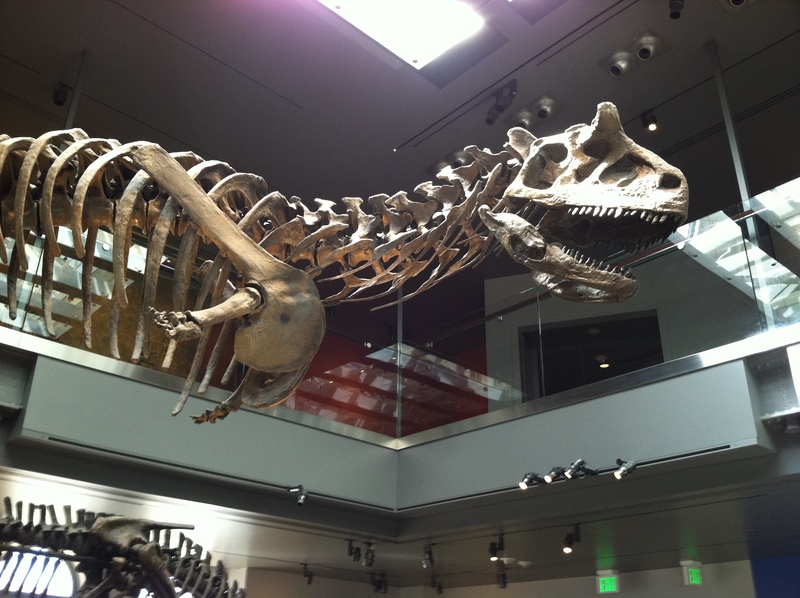 At two years old, this is the youngest known T. rex specimen. 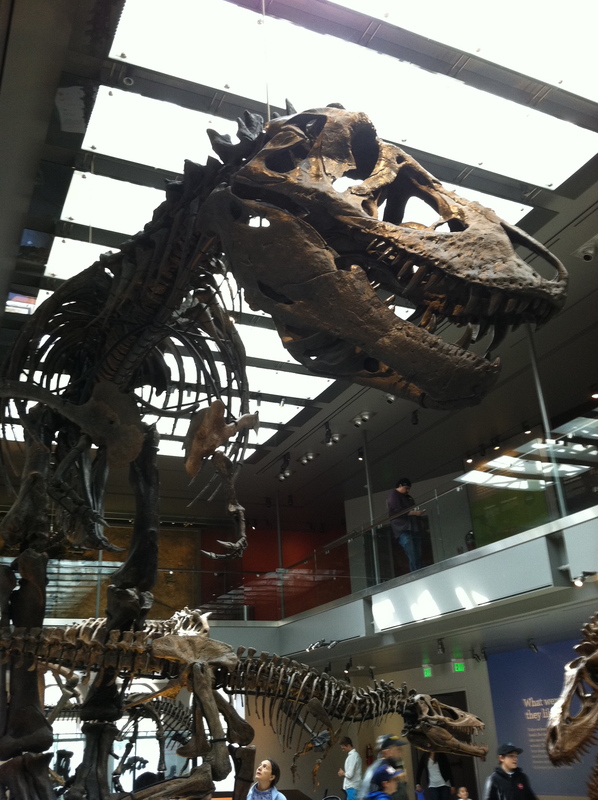 The second tyrannosaur is a twenty-foot adolescent. 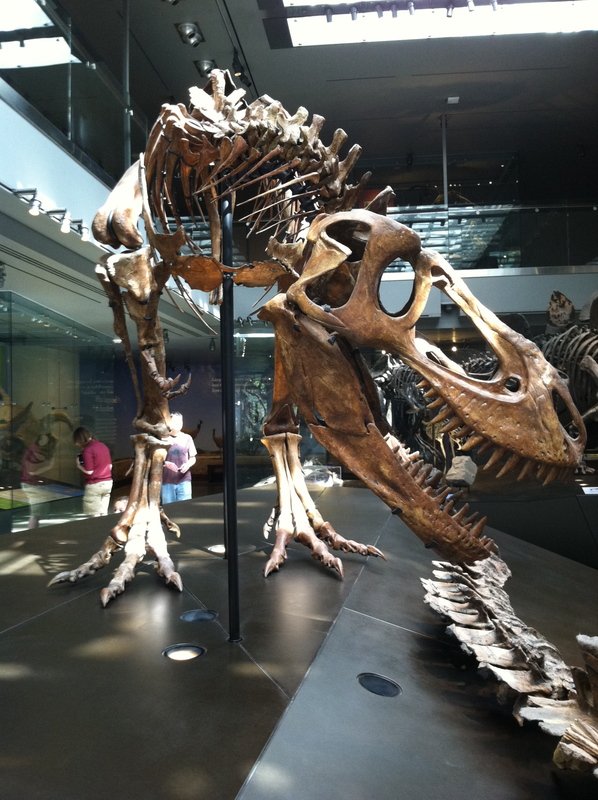 T. rex grew remarkably fast in its early teens, packing on up to 1.5 tons per year. And here’s the third animal, close to full size. Mamenchisaurus, a long-necked sauropod from China, dominates the first dinosaur gallery. Carnotaurus, the bulldog-faced meat-eater from Argentina. On a related note, on my last night in town my friends took me to an Argentine restaurant. Best thing about L.A. is the variety of dining options. 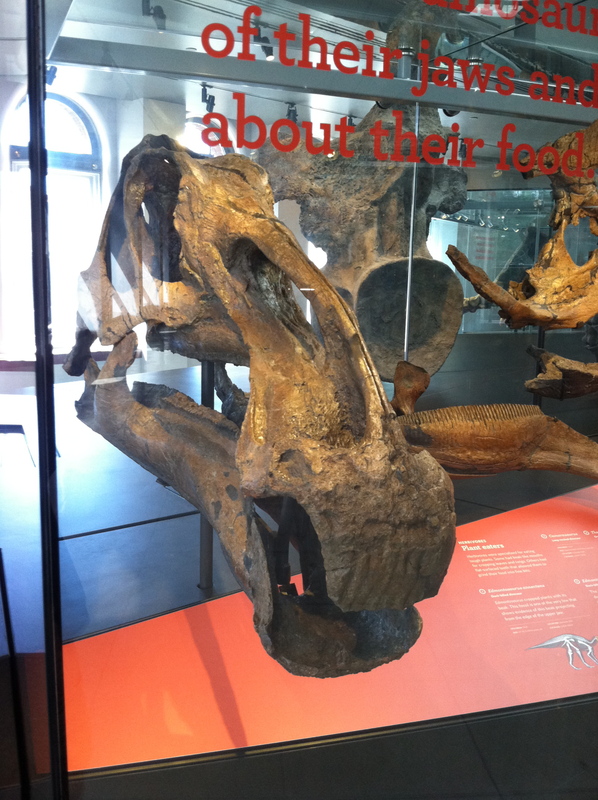 A hadrosaur skull. The horny part of the “duckbill” is really visible on this specimen. Allosaurus vs Stegosaurus. I do love a good Allosaurus skeleton. 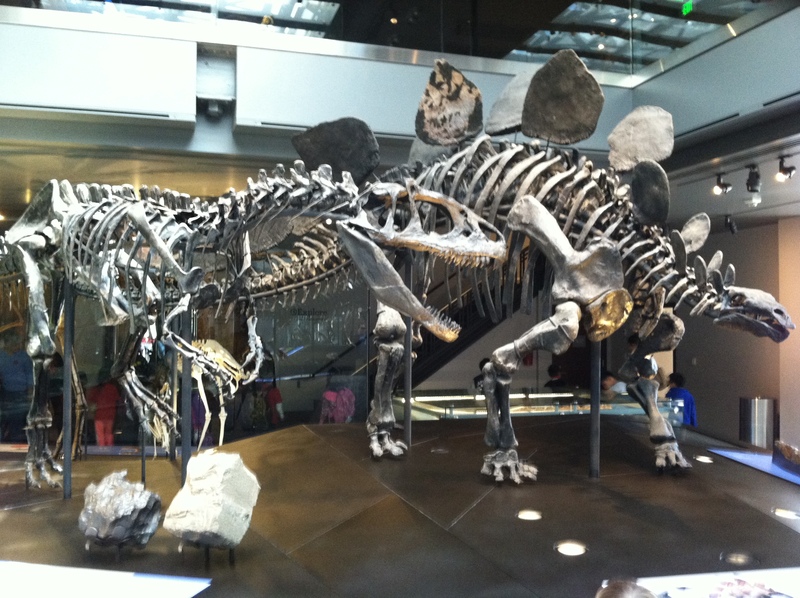 The Denver Museum of Natural History has a very similar mount. 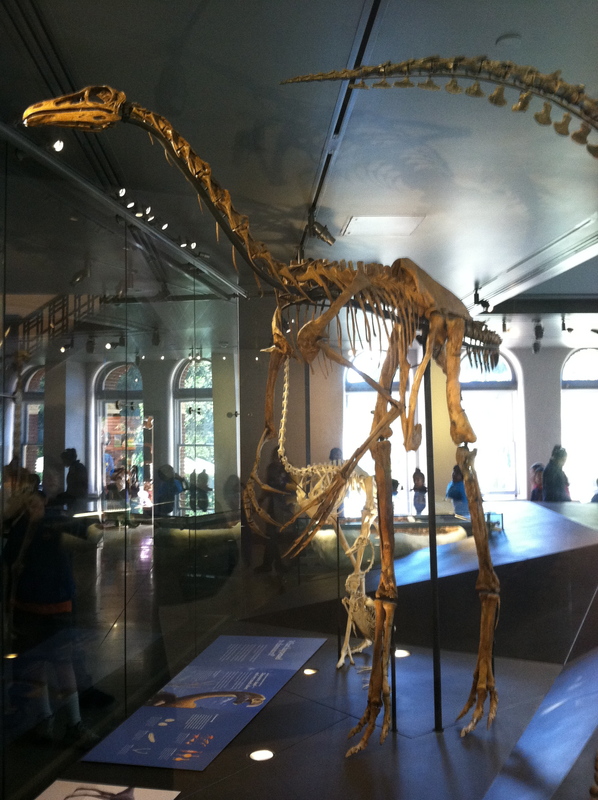 An ornithomimid. I think it’s Struthiomimus, but I don’t remember exactly. 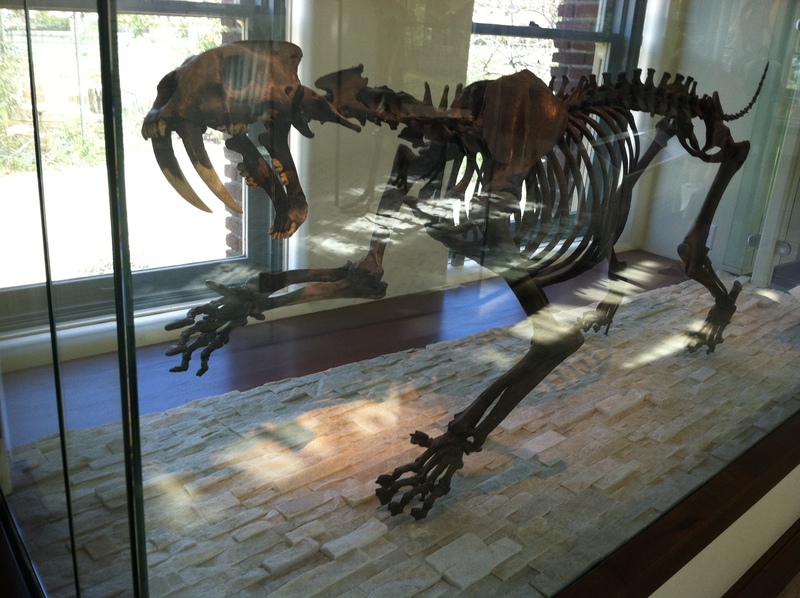 Unfortunately, we didn’t have time for the La Brea Tar Pits, but the NHMLAC does have quite a few specimens from the site, like this saber-toothed cat. And while we’re on the subject of all things prehistoric, the grand finale of my L.A. trip was a pilgrimage to the original Jurassic Park ride at Universal Studious Hollywood. I was wearing a t-shirt from the Jurassic Park River Adventure at Universal Orlando, and some of the ride operators at the Hollywood version asked me which one was better. As a connoisseur of all things JP, I feel eminently qualified to address this question, so here goes. In terms of the rides themselves, it’s pretty much a toss-up. The Hollywood version has a couple of neat outdoor effects that are absent in Orlando, an additional (albeit brief) encounter with the T. rex, and better-looking sauropods in the opening scene. On the other hand, I think the Florida ride seems a bit less rushed, which means much better pacing, a more coherent story, and a more effective build-up of suspense. For these reasons, I have a slight personal preference for Orlando’s version, but you can’t go wrong with either one. And that’s a wrap. Back to business as usual. My fellow Tennesseans, we now have irrefutable evidence that a minuscule portion of your tax money is going to private museums, historic sites, and other cultural institutions. DUN DUN DUNNN!! Noting the attendance at the Country Music Hall of Fame, the writer of the article linked above asks, “If the museum and other attractions are seemingly doing well, why then, do they need taxpayer money?” But then, after citing evidence provided by the Chattanooga History Center showing that their visitors are economically beneficial to the community, he claims that the Alex Haley Museum and Interpretive Center is located in a small community where the “economic development argument may not work,” and describes the museum’s low visitation and financial struggles. So your museum doesn’t deserve public support if business is booming, and it doesn’t deserve public support unless business is booming. 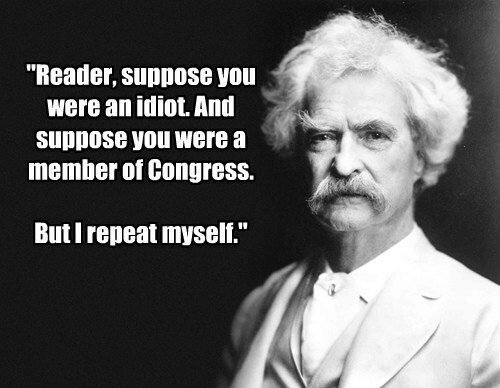 I confess that I don’t find this line of argument persuasive. I’m also irked that the article describes the institutions receiving these funds as “tourist attractions.” The Chattanooga History Center and Alex Haley’s home do indeed attract tourists, but referring to these historic and cultural institutions as “tourist attractions” conveys the impression that this is equivalent to giving taxpayer-funded grants to Six Flags or a miniature golf course. Russell Kirk defined a conservative as “a person who endeavors to conserve the best in our traditions and our institutions,” and noted that conservatives believe the past to be “a great storehouse of wisdom.” If we can’t spare even a small portion of our public funds for history and culture, then what is it we’re trying to conserve? I’m in Los Angeles this week, so maybe I’ll set aside some time to broaden my perspective of early American history by visiting a few Spanish colonial sites. This is off-topic but well worth your attention; I ran across this information on one of the religion blogs I read. Sean Lewis, who’s a professor at a Catholic college in Wyoming, and his wife Becca lost two of their young daughters in a car accident yesterday. A friend of theirs has set up an online fund to help cover funeral and medical expenses. Pitch in if you can; the girls were flown to Utah before they passed away, and the cost of that level of emergency care is apparently really high. Remember when we looked at the tradition that Patrick Ferguson was keeping two mistresses called “Virginia” in his camp at King’s Mountain, and that one of them died in in the battle and was buried with him? So there’s an eyewitness account corroborating the archaeological evidence of a second burial in Ferguson’s grave. Pretty neat! It’s good to see such high standards of historical literacy maintained in our nation’s capital. The charitable thing to do would be to chalk this up to a verbal slip and assume she had the founding of Jamestown somewhere in the back of her mind. But since this is the same person who thought Vietnam was still divided in 2010, and who once asked someone from NASA if the Mars Rover had taken a picture of Neil Armstrong’s flag, I’m not optimistic.